Description: This event has been postponed. We'll be rescheduling it for the summer. Look for details to come later on our website. Gini (Jeanie) Mohammad, from Red Sea Ethiopian & Mediterranean Restaurant, returns to Aldridge Gardens! 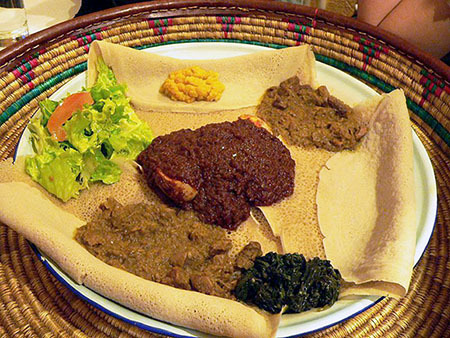 We'll reprise how to make Injera bread and go beyond with similar taste treats, as well as written recipes to take home! Cost is $30 for Aldridge Gardens members and $35 for nonmembers. Space is limited. Only 20 seats available. You don't need to have attended the first Ethiopian Cooking class to take part in this one. This event has been postponed. We'll be rescheduling it for the summer. Look for details to come later on our website.